This patented 4,000 BTU liquid propane heater connects directly to a 1 lb. LP cylinder and is the perfect solution for heating in a golf cart. The unit features a wind resistant burner and pilot system for optimal heat output in windy conditions and when the golf cart is moving. It also features a unique safety tip over switch that minimizes nuisance shut-offs when driving on bumpy cart paths. North America's Most Popular Portable Propane Heater! This patented radiant 3,800 BTU Liquid Propane heater connects directly to a 1 lb. cylinder and is the perfect solution for heating small spaces up to 95 sq. 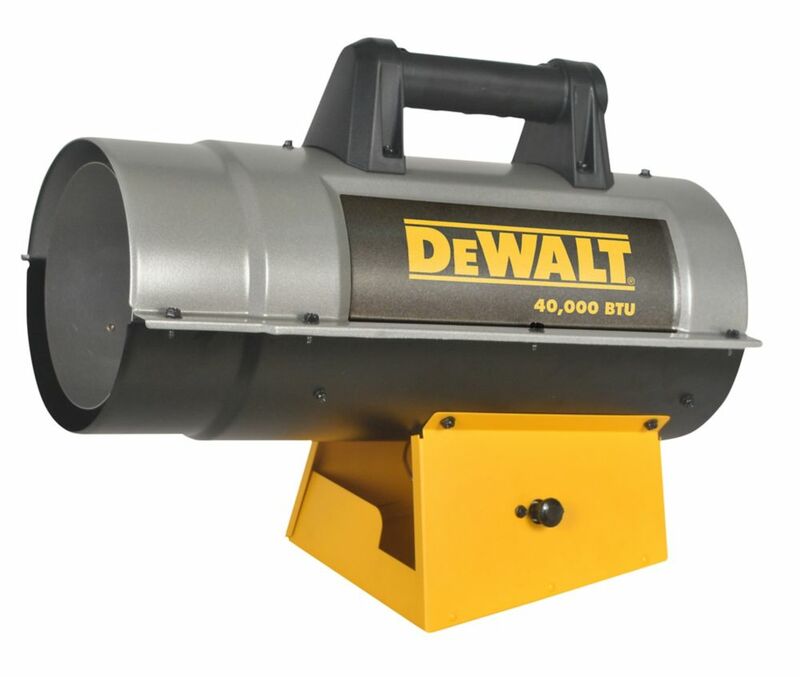 ft.
40k BTU Propane Forced Air Heater DEWALT&nbsp;industrial forced air propane heaters, are construction-grade quality built for the Canadian winter. They're manufactured with a rugged two-piece barrel, ergonomic handle, and engineered with Quiet Burner Technology (model 125 and higher). They're typically used for workshops, barns, job sites, and home remodelling. CSA approved, and tested on the jobsite, they're Guaranteed Tough. 40k BTU Propane Forced Air Heater is rated 4.4 out of 5 by 10. Rated 5 out of 5 by Joe from It does exactly what I expected it to do. Nice... It does exactly what I expected it to do. Nice and warm in my barn work area. Rated 4 out of 5 by HomeDepotCustomer from It’s good for the amount I paid for it! ... It’s good for the amount I paid for it! Rated 5 out of 5 by Charles from Good product, good heat source.Small and easy to carry around.... Good product, good heat source.Small and easy to carry around. Rated 5 out of 5 by Joe from What a great little heater! I have a radiant... What a great little heater! I have a radiant propane heater that I use in my garage and it does fine but having the forced air on this little Dewalt makes heating the garage a breeze (pun intended). I am very pleased with my purchase and recommend this heater. Rated 4 out of 5 by Mac from Nice heater but not good for large spaces. ... Nice heater but not good for large spaces. Rated 1 out of 5 by Phillip from I love DeWalt. Sady I let that attitude persuade me... I love DeWalt. Sady I let that attitude persuade me to buy this heater without reading reviews. Big mistake. Total junk. It lit one time and never again. So I got online to see if there might be a trick. None. Only tons of reviews saying theirs would not light either. Beware. Will this heater heat a two car insulated garage? Can it be used in the garage with ventilation? The answer is it depends, assuming an average width, height and with four exposed surfaces with -40 outside and an average R-value of 13 US (or R-value of 2.29 SI). You would probably want the garage to be about 20 &deg;C inside, which is a temperature difference of 60 &deg;C. Given a typical double car garage in Canada is about 6m x 6m x 3.1m. You would have an exposed area of ~120 square meters (depending on roof slope), and a heat loss of (60/2.29) = 26.2 W/m^2 for a total heat loss of 3.144 kW and this heater can provide 11.7 kW. It should be able to provide more than enough heat for an average sized double car garage even leaving some losses for ventilation and less insulation.